Bartlett is committed to rendering the world; that which is glorious and painful, all that connects us and makes us feel singular, all that illuminates and bewilders. Her poems orbit around family, and she telescopes out to larger truths, often both lovely and heartbreaking, by turning a microscopic focus on image. In “For Keeps”, readers are forced to reckon with the death of a son, and the vibrant life of their young daughter—all plaited in a way that denies neither the terror of such finality nor the joy of such open wonder. This focus on intentionality and healing is inherent in her poetry, particularly the meditations on sisters, fathers, husbands, and children. Bartlett does not flinch from our bodies’ failings, and how our body’s disintegration can either momentarily shut us down or set us ablaze with love. 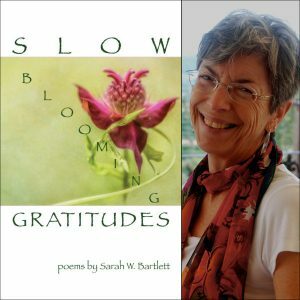 Bartlett throws open windows in readers’ minds and hearts as she offers us “Hunger” in which a father, wheelchair bound “in shades of scarlet maple/and reckless fuchsia/of late-blooming impatiens” seizes his daughter in an unexpected hug, “…making up for lost time/or anticipating it” (7). Loss is inescapable in this collection of poems, and yet Bartlett’s greatest strength is in recreating the complexity of loss and sharing her mighty will to look toward beauty. Whether it be reconciling the process of a sister’s illness, a husband’s body becoming a new and unknown territory, or the death of a beloved cat, Bartlett turns her gaze, and thus the gaze of readers towards what remains: love. Barbara Lawhorn is an Assistant Professor at Western Illinois University. She’s into literacy activism, walking Banjo (the best dog in the history of the universe), running, baking and eating bread, and finding the wild places, within and outside. Her most recent work can be found at The Longleaf Pine, BLYNKT, Nebo: A Literary Magazine, and Naugatuck River Review. Her favorite creative endeavors are her kids, Annaleigh and Jack.